A United Nations team is set to return to Iraq to examine ways to transfer power to an Iraqi government. Iraq's Shia Muslims are holding nearly daily protests against US plans for the regional selection of representatives. UN backing for the US view that direct elections are not yet possible could quell that unease, correspondents say. 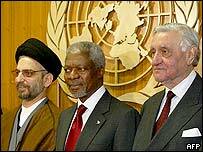 Secretary General Kofi Annan has not yet announced the return of UN experts to Iraq, but diplomats say the decision has been taken. Mr Annan met members of the Iraqi Governing Council and US administrator in Iraq Paul Bremer on Monday. He has said he agrees with the US analysis that problems with security and voter registration make direct elections impracticable before 30 June, when the US wants Iraqis to form a transitional government. But he will let experts come up with their own conclusions if and when he deploys them to Iraq. They would be the first UN staff in the country since a mass withdrawal in August following a bombing of UN offices in Baghdad which killed 23 people, including Mr Annan's special envoy Sergio Vieira de Mello. "I am looking at the possibility of sending a mission to Iraq to offer advice on the ground," Mr Annan told reporters. He said plans on both sides were "open to refinements". A mass protest by Shia Muslims in Baghdad on Monday was followed by a smaller demonstration on Tuesday, both calling for direct elections. 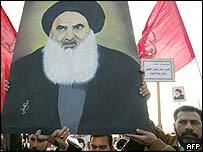 The rallies were generated by the concerns about the power transfer voiced by the top Shia cleric in Iraq, Ayatollah Ali al-Sistani. But one of his representatives has told the BBC that he would reconsider his position if the UN concluded that direct elections were not feasible for now. The BBC's Middle East analyst, Roger Hardy, says the US is hoping for that outcome should UN experts go back to Iraq, but he cautions that time is short. By the end of February the Governing Council is supposed to finish drafting what's being called a transitional law - a kind of mini-constitution which will provide the legal framework for the crucial transition period, he says. Tuesday's demonstration in Baghdad involved supporters of Muqtada Sadr, a more militant cleric than Ayatollah Sistani. But our correspondents in Iraq say the protest raised many of the same concerns as the recent demonstrations of Sistani followers in Baghdad and Basra and was similarly non-violent. Correspondents say the Shia - long repressed under Saddam Hussein - would like the power their numerical superiority would bring. But coalition forces are keen that Iraq's minorities including Sunni Muslims and Kurds are not sidelined in a new government. In southern Iraq, Japanese troops have taken up their positions in the country's first overseas deployment to a recent combat zone since World War II. Four pristine military vehicles emblazoned with the country's Rising Sun symbol were cheered by Iraqis as they sped through the streets of the dusty southern town of Samawa. The advanced team of 35 soldiers is preparing the ground for a 1,000-strong deployment which will carry out humanitarian and reconstruction work. There has been concern in Japan about the role of the soldiers - banned under the constitution from fighting overseas - and that they might become involved in combat. "There is no consensus in Iraq"